The words come from perhaps the most famed gardener-poet in history, and serve as part of Wave Hill's Emily Dickinson Rendered, a project featuring the takes of ten visual artists on the poet's life and work, on display until May 25. For Brece Honeycutt, a Washington, D.C. artist-historian who combines visual imagery with research, the project was a natural. She began by combing through books about Dickinson's gardens in Amherst, Massachusetts. "I read that Dickinson would send bunches of flowers with written poems tucked inside and that she would leave poems in the hedge between her brother's house and hers, says Honeycutt. "She juxtaposed her poems with nature, so it seemed only fitting that the labels etched with her poems would be in the garden." Honeycutt chose copper after discovering that it was often used, at Dickinson's time, for garden labels. "I wanted the labels to be weather-resistant, but also to react with the outdoor elements. For the exhibition, the labels hang on the walls inside the gallery and are bright and shiny, polished copper," she says. "Charles Day, my collaborator, and the interpretive gardener at Wave Hill, tends the labels and waits for the related plant to bloom. At this point he takes the label off the wall, attaches it to a stake and places it next to the plant." The labels will stay with the plant throughout its blossoming-the copper aging and tarnishing as the flowers spring forth and fade-and then return to the gallery once the blossoms are gone. "Copper changes over time, and I find all of these changes quite beautiful," she says. "When the labels are first placed in the garden, they are bright and reflect the sun, acting as beacons. Over time, the labels will begin to change colors, just as the plant changes and fades. At the beginning of March, I placed a label in my backyard and have been watching the changes in the surface as they take place. Now there are yellows and greens on the surface, a touch of purple, and the edges are becoming darker with green." 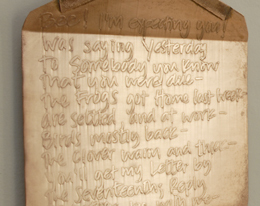 Honeycutt wrote the excerpts on her 36 copper plates with a Sharpie pen, after which they were etched in ferric chloride for one to two hours. A fabricator folded the triangular flaps, made to resemble the envelopes Dickinson would often use to scribble down her inspirations, and soldered on an attachment to be used for both wall-hanging and staking. 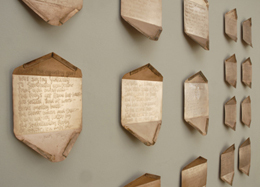 Honeycutt has made use of copper before, notably in Silence, an installation at Bryn Mawr School in Baltimore that uses books with copper pages to display etched texts related to the school's founder, Mary Elizabeth Garrett. Kristen Hileman, curator at the Smithsonian Institution's Hirshhorn Museum and Sculpture Garden, says that Honeycutt's art tells the stories of notable female figures "in a way that is intelligent and poetic, but never heavy-handed." "Viewers undertake a process of discovery when they encounter Brece's work," says Hileman. "Her art requires a smart, thoughtful interaction rather than a quick, superficial look. Brece also is incredibly adept at transforming fundamental materials-copper, glass, slate, bricks, paper-into elegant and beautiful representations of the narratives she seeks to communicate." Emily Dickinson Rendered continues through May 25 at Wave Hill, West 249th Street and Independence Ave., Bronx, NY. For more information, call (718) 549-3200 or visit Wave Hill.